We're home. We stopped to pick up some milk and bread, then cruised into our driveway and both breathed a sigh of relief. We did it! Almost 6000 kms touring city and country roads, meeting hundreds of people who came along to greet us, sleeping in many unfamiliar beds, eating food from shops, often missing out on meals and sleep. The absolute standout for me was listing to the stories of those who chose to tell theirs, sometimes whispered and sometimes out loud for all to hear, and being told how significant my books, blog and forum have been. I am grateful to know it. I was pleasantly surprised at the number of young people who came along - single and married - who are excited by the prospect of an unusual life ahead of them, marching to the beat of their own drums. It was a gruelling three weeks, but the joy of meeting all those people kept us going and smiling at the experience. I will be ever grateful we did it. 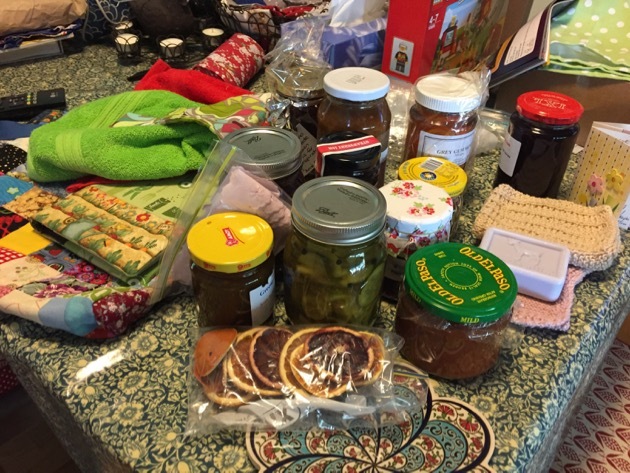 Some of the many thoughtful and useful gifts we received along the way. We really appreciate your thoughtfulness. 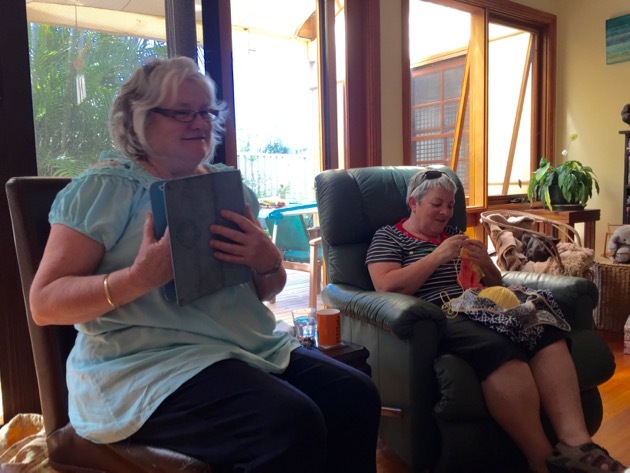 Morning tea, lunch, a swap and chat with Rose, Rhonda, Judy and Jenny at Rose's home. Judy and Jenny working on their crafts. Thanks to everyone who took the time to travel in; thanks to the libraries and book shops that hosted us; thanks to Rose, Tony and Mavis for their hospitality and to the forum mods, Rhonda, Judy and Jenny for travelling in for lunch and a chat in Wollongong; thanks for all the gifts we received; thanks for the comments made here; thanks for making us feel loved; thanks for making the tour so worthwhile and interesting; thanks for proving, yet again, that this DTE community is a loving and caring one. I have to thank my two travelling companions too, Hanno and Tricia. Hanno came down with a cold in Albury and then developed a secondary chest infection and a bad cough which he still has now. He's going to his doctor tomorrow but he soldiered on during the tour. Tricia and I reminisced about our childhood a lot when we saw so many things that reminded us of past times. The memory of driving around in that car with the two of them, squabbling about directions, getting lost, laughing, talking and sightseeing will be with me for a long time. Glee books in Glebe, Sydney. 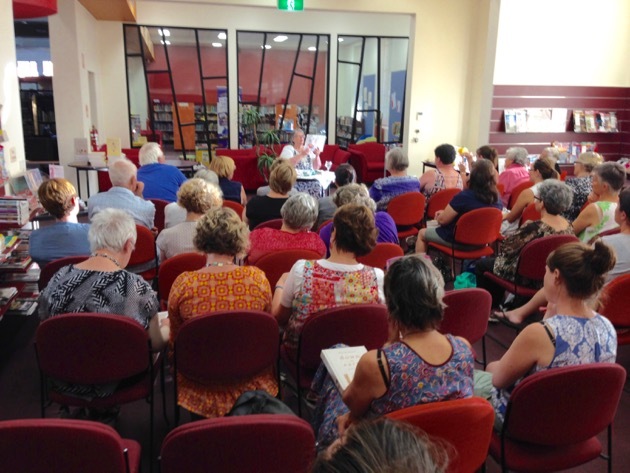 A talk in Wagga Wagga. 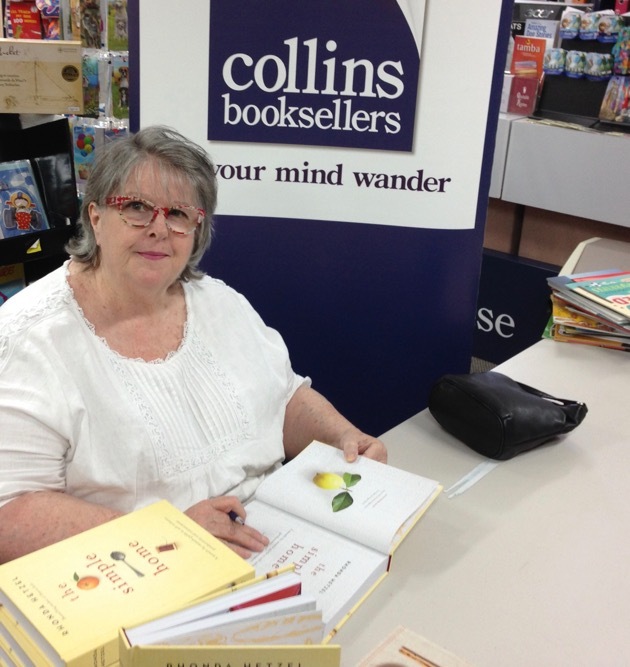 Signing books at Collins in Shepparton. And here we are now, smiling, at home again. 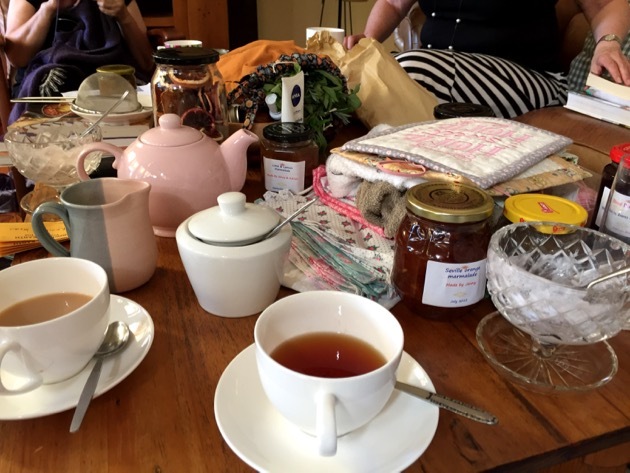 We've survived being out in the world, driving across Sydney city streets and under the harbour at dizzying speeds to keep up with fellow drivers, at night, in the rain; we survived two nights on a ship in Bass Strait, getting lost, terrible food, rudeness and being exhausted most mornings when we woke up. We've experienced what feels like emptiness in overcrowded cities as well as the charm of smaller regional cities and country towns. We live in a beautiful country, there is no doubt of that. 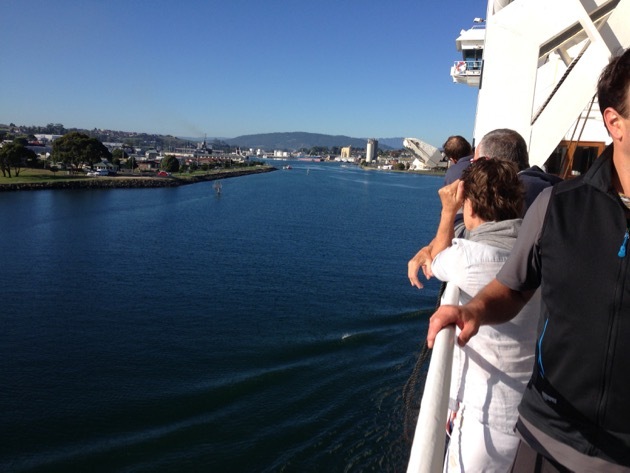 Sailing into Devonport harbour in Tasmania. The main street in Yachandandah. 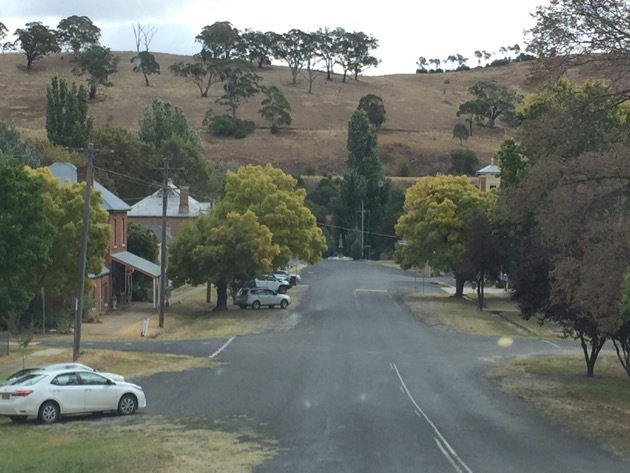 Main street in Carcoar, NSW. 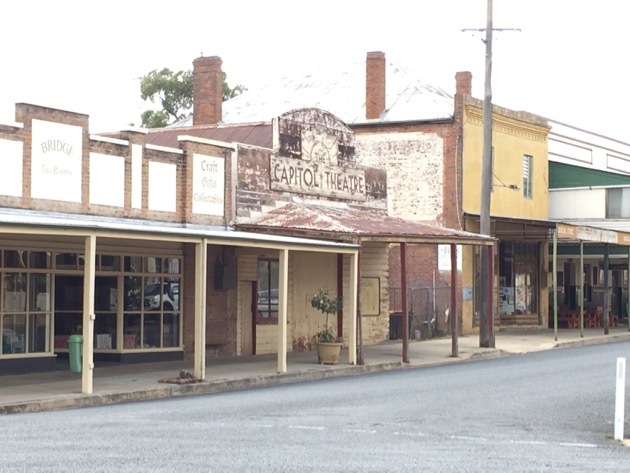 The old Capital Theatre in Carcoar. 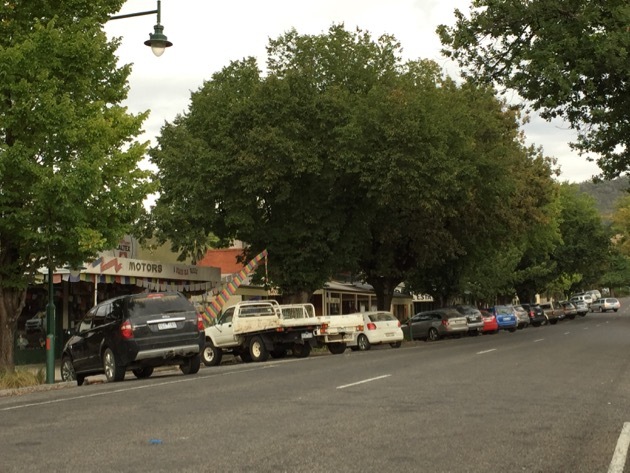 The town was established in 1839 and it still looks to be very similar to how it once was. While we were away I had the chance to reevaluate my life here - to see it from a distance and decide if this really is what I want and make changes if they're needed. I was inspired and motivated by so many of the people we met. Driving those long miles gave me the time to think deeply about how I will live until I stop living. This is it for me. This is what sustains me and makes me the best person I can be - being here on this bit of land, being a wife, mother, grandmother, sister and friend. I know now that here is where I'll be until I die and that is set in stone. So lovely to hear you are home safe and sound. Great to see the pics of the DTE catch up too. So pleased you made it home safely, Rhonda and Hanno. Jamie will be so excited to see you both. Now for a good rest. Welcome home Rhonda and Hanno! You've been sorely missed. we always feel this way Rhonda, after we have been away interstate to visit family, absolutely love to see them and enjoy our travels, but once we are at home it is always reinforced back in our minds and hearts that this is the life we want to live and where we want to live it and all the children and grandchildren know that Ma & Pa are at home on the "farm". I have really enjoyed reading your new book and it has also "talked" to me and reinforced the knowledge that what we are doing is absolutely the right way for us. Enjoy your home and life. Good for you, Rhonda! Home again after doing some much needed and helpful work; which it sounds most people really appreciated. Enjoy being home now. As I was reading your post tonight, I was reminded of my Irish Grandmother who ALWAYS ended every trip with, "Home again, home again, Jiggity Jog!" Welcome home! Rest. Restore. Rejoice. Home again, home again. Like Dorothy said upon returning from her trip to Oz,"There's no place like home". Welcome home - you made it!! That is how I always feel, even on short trips out and about, that I survived "out there" LOL. I bet your next few days of rest will be ever so sweet. Glad to hear you are home safely, you both did a great job travelling such a distance, well done & thank you. I have read The Simple Home from cover to cover & have started to put a few more simple living ideas into practice,thank you Rhonda for being such an inspiration. I'm always saying to my partner, Rhonda said this, Rhonda said that & he'd say who is Rhonda, now he knows who I'm talking about & sometimes he'll I wonder what Rhonda would do. Welcome home. It must be such a relief to be home and finally close your door Rhonda and Hanno! Thank you so much for managing to get to as many stops as you did on your tour - I would never have had the chance to meet you otherwise and I feel that you and the forum a big part of my life. 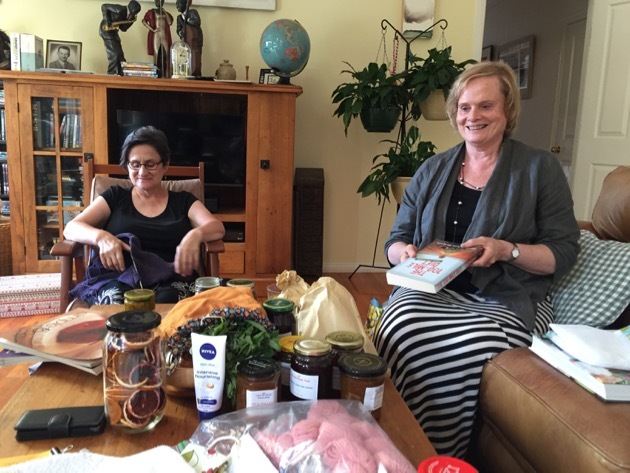 Having my two daughters along when I met you in Hobart provided a springboard for a good discussion about independence and simple living and I could see the girls taking on board a lot of ideas and info for consideration and thought - simple living for the next generation, which I feel may be even more essential for them than it is now. You've done a great job, enjoy your rest in the best place in the world - home! Welcome home, RJ. Finally a good night's sleep in your own bed. Now I hate to tell you that you are wrong (but I will), but that photo you have listed as Albury was actually at Wangaratta. I can see Elle, Toni and myself (and I'm also taking a photo of you at that same time)!!! I'm glad you had such a wonderful tour, a huge one at that! Also nice to hear that you had some young ones listen to you and buy your book. If more young people start the simple life early, we'll all be onto a good thing. I'm so glad you had such a wonderful trip, and I thank you for sharing it all with us. It's wonderful that you had the chance to see in a tangible way the impact you've had on so many others' lives. Hope Hanno gets well soon. I so understand that feeling of coming home, and how grateful one can feel to be doing it, despite having a wonderful adventure elsewhere! Time to pull up the drawbridge and enjoy your home for several days; it sounds like you definitely earned a good rest! I'm so glad to know you are both safely home from a never-to-be-forgotten epoch in your lives. My mother used to say "Nowhere better than home!" in her upper palatinate dialect, even when she just returned from visiting her neighbours. When I was young, I could not understand this. The older I get, the more I know she was right. But I am sure the memories you made are will stay with you forever. Welcome home, Rhonda and Hanno. What a whirlwind adventure you've had! It's always good to be home! Blessed are you both. Keep some time and peace to 'recover' from this beautiful trip and treasure all your experiences. Happy to hear you are home safely and back in your zone.I hope Hanno is able to heal quickly now you have been able to stop. It was lovely to meet you and the little thing I whispered to you is not happening much to my relief. Much love to you all. Home Sweet Home. Nothing like it!! Relax, recover and enjoy your homecoming. Best wishes to Hanno for a speedy recovery. glad you made it back safely, & what everyone else has said too! So glad you are all home safe and sound. If I had half a brain I would have 'stormed' the Newcastle ABC studio to see you but I thought at the time that as it was a recording radio studio that the public would not be allowed - I should have waited outside! Never mind. Welcome home Rhonda and Hanno. I hope Hanno is feeling a bit better now he's home again ? It was an honour and a privilege to meet you and Hanno in person. I wish Ken had been with me, so he could have better understood my enthusiasm for your books and the forum! Glad you are back safe and sound...can't wait until I can buy your e-book over here in the Uk! I would have loved to have been there at one of your talks. What a successful tour you had with time and distance to consider your place in this world as well. So important for all of us. Well Done! It's always great to return home! 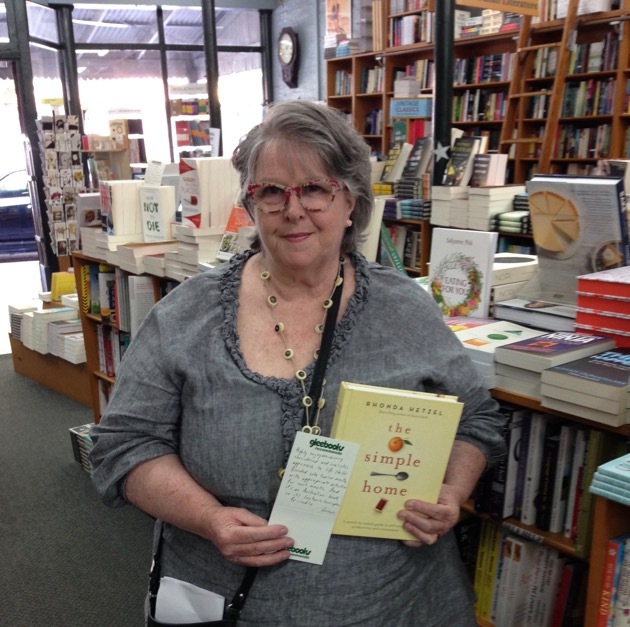 Glad you had a great time meeting your wonderful readers and friends. Love and gratitude right back to you, Rhonda and Hanno, it soothes me to know there are such people. I myself will be off for a few days, but it is off to the beach and for closer bonding with my own little family and the girls in turn with their cousins who will be staying next door. I have said it before and I'll say it again, Australia has the most intriguing place names! P.S. Hello Hanno! Hope you get better soon. New to your blog so I went back and read a lot. It resonated with my heart and where I have been headed in our life for the last few years. Now starting all over with a new property (downsized) I wondered if I could do it all again and rebuild the gardens. Now I know I can, just one thing at a time. No place like home! I know when I've returned home after a lengthy trip (or a short one), I've felt like hugging my house! Time to rest and refresh and then you'll share more wisdom with us. I have enjoyed coming along on your book tour and especially liked your observation at the end of it. Welcome home Rhonda and Hanno, best place there is, even after a marvellous adventure. Bet you can't wait to see Jamie and Sunny. Welcome home Rhonda and Hanno! Thank you for the work you do. You are an inspiring woman. Is there a way to get your book in the states? You can buy the book at the Book Depository in the UK. It has free international delivery. Welcome home. Sounds like you had an exhausting but rewarding journey. I finally got my copy of your new book and love it. Hope Hanno is feeling well soon. Give him a hug from me. I've enjoyed reading about your adventures and it takes a lot of gumption to do what you have just done. Well done! I so enjoyed the account of your journey. There are so many of us that have the same mindset and goals of simple living. You always make me question things, inspire and guide me. Thank you so much for what you do. Enjoy being home again! Welcome home Rhonda and Hanno from your interesting tour. I loved reading about your adventures on your Book Tour and seeing pictures of the places you visited. I am reading your new book at the moment which is so informative and I love it! I do hope Hanno recovers quickly, now he can get some rest and quiet time. 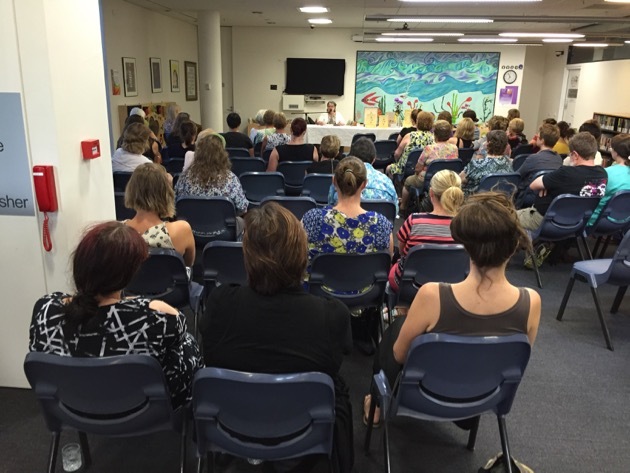 Glad to have met you at Kogarah Library, and happy to hear that you and Hanno made it safely home. Enjoy your time of peace and quiet, Rhonda. You are an inspiration to all of us who follow your blog and have your lovely books for reference in our homes. Thank you. Glad you are back. You are so inspiring.